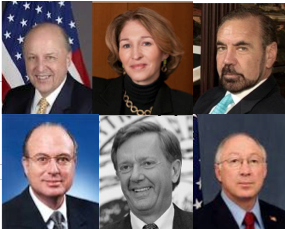 Among the signers of a letter calling on the president to ease restrictions in the Cuban embargo are, clockwise, former intelligence chief John Negroponte, former foreign policy advisor Anne-Marie Slaughter, Related Group CEO Jorge Perez, former ambassador Paul Cejas and former Secretaries of the Interior Bruce Babbit and Ken Salazar. A group of businessmen and former high-ranking U.S. officials is asking President Obama to relax the embargo on Cuba. They want the President to ease travel and investment restrictions to help Cubans with their economic and social needs. A letter sent last week by the group had 44 signers including former intelligence chief John Negroponte, former foreign policy advisor Anne-Marie Slaughter, and Jorge Perez, CEO of the Related Group. A poll by the nonpartisan Atlantic Council found that 64 percent of Miami-Dade County adults favored engaging more with Cuba. Miami-Dade has the largest concentration of Cuban-Americans in the country. Supporters of the embargo say the demands are misguided. Former Congressman Lincoln Diaz-Balart of Miami led Congress to write the embargo into law in 1996: “This letter is fundamentally rooted in people seeking business with the dictatorship. It’s not rooted in something pure. The people are actually asking the President of the United States to violate the law." Bilbao maintains the measures proposed are well within a president's power and points to the backgrounds of some of the letter's signers, which includes former senior officials for foreign policy. Below is a history U.S.-Cuba relations, courtesy of the Council on Foreign Relations. Was "Cuban Twitter" Dumb Or Defensible? Or Both? Confession: When I criticized ZunZuneo as the story emerged earlier this month, I left something important unsaid. I support its basic intent. That is, the effort to help Cubans or anyone else access news, information and opinions that authoritarian governments around the world try to block. Was The Miami Trial Of The Cuban Five Fair? On a special edition of The Florida Roundup, we discuss the controversial case of the Cuban Five, Cuban agents who were convicted in 2001 of espionage along with other charges. In Cuba, they are called heroes, their faces on billboards across the island country. In the U.S., they are relatively unknown spies. Call it "Castrocare." Cuba's former leader Fidel Castro sent doctors abroad for decades to work throughout Latin America and as far away as Africa. In some cases, like Haiti, the medical missions were seen as purely humanitarian. In other places, like Venezuela, it was a form of barter that provided Cuba with subsidized oil imports.